“We’ve shown that by the age of 24 months, children are not only aware that other people may be evaluating them, but that they will alter their behavior to seek a positive response,” says Sara Valencia Botto, an Emory PhD candidate and first author of the study. This concern for reputation manifests itself in everything from spending money on makeup and designer brands to checking how many “likes” a Facebook post garners. In a second experiment, the researcher used two different remotes when demonstrating the toy to the child. While using the first remote, the researcher smiled and said, “Wow! Isn’t that great?” And when using the second remote, the researcher frowned and said “Uh-oh! Oops, oh no!” After inviting the child to play with the toy, the researcher once again either watched the child or turned to the magazine. During a third experiment, that served as a control, the researcher gave a neutral response of “Oh, wow!” when demonstrating how to use the two remotes. The children no longer chose one remote over the other depending on whether the researcher was watching them. A final experiment involved two researchers sitting next to one another and using one remote. One researcher smiled and gave a positive response, “Yay! The toy moved!” when pressing the remote. The second researcher frowned and said, “Yuck! The toy moved!” when pressing the same remote. 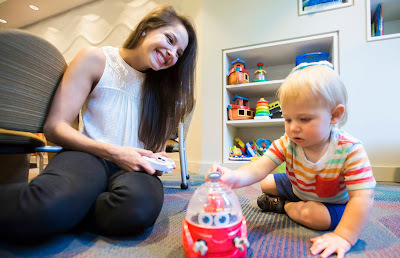 The child was then invited to play with the toy while the two researchers alternated between either watching or turning their back to the child. Results showed that the children were much more likely to press the remote when the researcher who gave the positive response was watching. And she is following the 14- to 24-month-old children involved in the published study, to see if the individual differences they showed in the experiments are maintained as they turn four and five. The researchers are measuring social and cognitive factors that may have predictive power for individual differences — such as language ability, temperament and a child’s ability to pick up on social norms and to understand that people can have beliefs different from their own. “Ultimately, we hope to determine exactly when children begin to be sensitive to others’ evaluations and the social and cognitive factors that are necessary for that sensitivity to emerge,” Botto says. The American Psychological Association contributed to this report.